The Korean shamanic ritual kongsu (‘oracle’), which is performed twice in succession (once for an ancestor, and once for the divinity Taegam) is part of a funerary rite held by a group of female shamans (mudang) in the Seoul area in 1994. The study provides a word by word transcript of the kongsu ritual, along with a literal English translation. By correlating what happens in the ritual ‘on the stage’ with what is implied to takes place ‘off stage’ (i.e. during the pauses), the analysis seeks to identify the various ‘participants’ and the roles they play. The study focuses on the difficulties of specifying the identity of the speaker at any given moment of the ritual (the speaker has the multiple identity of shaman/ancestor/divinity), and the identity of the ‘person’ to whom the speech is directed. It also suggests what transformations of emotion the participants experience during the ritual (e.g. their sense of the supernatural). The study of kongsu is important also for what it reveals of the way that the shaman identifies the cause of a “crisis”, and brings it to resolution – the very aspects that makes each ritual (even ritual of the same type) unique. The purpose of this article is twofold: 1) to provide the reader with a new standpoint from which to effect an analysis of those Latin American literary works which, frequently imbued with various degrees of so-called ‘esoteric’ features, are often classified under the rubric of ‘magic realism,’ ‘marvelous real,’ or even ‘fantastic realism’; and 2) to present a functional model which can be applied to similar literary works across historical and cultural boundaries. The application of this theory is based on the identification and contextualization of shamanic and/or shamanistic characters, elements, and symbolism presented in these texts and habitually conjoined to formulate a worldview whose cultural roots can be directly or indirectly traced to shamanic origins. In order to derive deeper significance and understanding from this often cryptic and enigmatic worldview one must adopt a “shamanic perspective,” a viewpoint which will facilitate a literary analysis and comprehension within the context of a unified interpretive and cultural framework. The standpoint of the shamanic perspective is the shaman and shamanism itself, and its formulation is the result of an interdisciplinary study drawing from comparative mythology, history of religions, cultural and psychological anthropology, as well as history. This shamanic perspective will be employed in the analysis of selected works of Gabriel Garcí­a Márquez, Alejo Carpentier, Isabel Allende, and Julio Cortázar. The paper presents the shamanic dance tradition of Hayachine Kagura and discusses a special dance this kagura performs: Gongen mai, or the dance of the mountain god, manifested in a mask of a mysterious animal. This dance is central to the kagura of northeastern Japan, which is deeply influenced by the doctrines and practices of Japan’s mountain ascetics. Kagura, itself an ancient shamanic ritual performance, is the natural context for shamanic dance. However, our case study of Gongen mai presents us with a puzzling shamanic choreography, which suggests a “reversed possession”. Instead of the common shamanic process in which a god possesses the dancer, here the dancer possesses the god. In this article, the case is presented and an explanation of this intriguing choreography is attempted. Vilmos Diószegi (1923-1972), a Hungarian ethnologist, died more than quarter of a century ago, so it is timely to review and evaluate his oeuvre. The article discusses Diószegi’s education and fieldwork. He studied the Buryats and the Khakas in 1957, and, in the following year, the Karaghas and Tuvas. In 1960 he spent three months in Mongolia, and in 1964 he studied Kumandi shamanism in Gorno-Altaisk. The article further describes the Archive of Shamanism founded by Diószegi, and it evaluates the Hungarian scholar’s publications, including those which appeared after his death. A section is devoted to the research Diószegi conducted on the traces of shamanism to be found in Hungarian folk beliefs. The purpose of this study is to effect a comparison between therapeutic hypnosis and shamanism. The conclusion of this investigation is that clinical hypnosis in its most comprehensive sense is simply a cultural and historical adaptation of shamanism, the most widespread and archaic spiritual and therapeutic tradition. The foundation of this theory of the equivalence between hypnosis and shamanism is the imagino-hypothesis. As applied to the present study, the imagino-hypothesis holds that imagery and/or imagination, in both shamanism and hypnosis, play essential roles as catalysts in the process of generating spiritual, psychological and physiological responses. 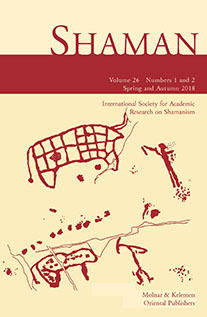 Although the imagino-hypothesis is not the explicit subject of this paper, it is nevertheless useful for the reader to keep in mind that it constitutes the basis for the definition of both hypnosis and shamanism as “images evoking responses.” Through a brief examination of hypnosis in its broadest terms, and after dismissing the prevailing myth of hypnosis as trance, a functional paradigm for therapeutic hypnosis will emerge. This functional paradigm will in turn serve as the foundation for the comparison between clinical hypnosis and relevant healing facets of the shamanic tradition. After drawing on numerous parallels between shamanism and clinical hypnosis, both will be summarized as variations of the same phenomenon: the masterful manipulation and presentation of mental images in the client for the purpose of achieving desired spiritual, psychological, and physiological responses.